In the 1940’s, State Road 7 was the western boundary of civilization in Broward County. Frederick C. Peters had purchased 10,000 acres in the wild west, but the only living creatures there were his cattle. 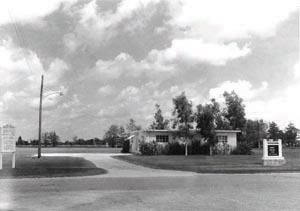 In 1947 the Clark family optioned land from Peters and began building a development called Plantation Homes along Broward Blvd., East Acre Drive, and Cypress Road. Unfortunately, in 1947 two wet hurricanes struck and again in 1948 two more wet hurricanes hit, totally flooding the area each time. At that point the development consisted of just thirty homes. Because of the floods real estate salesmen would no longer bring people out to look at Plantation Homes. For the pioneer residents going to church involved a long drive over country roads into downtown Fort Lauderdale. But one young mother, Dorcas Ward, was determined to have a church in her own community. There was just one phone in the development, so Dorcas knocked on doors and wrote letters to prospective residents until she had the nucleus of a congregation. 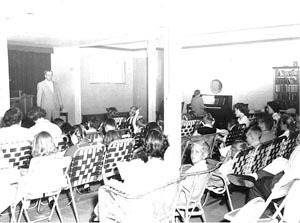 In September, 1948, 28 residents held their first worship service in the real estate offices of Frederick Peters and Bert Ward. The members continued to meet, reading sermons sent to them by Dorcas’s former pastor, Wiley Scott of the Miami Beach Community Church. Eventually the members moved their services to a plain cinder block building on Cypress Road. This building was intended to be the first community center, but it was being used by the builders as a warehouse. On Saturdays Dorcas and her husband moved out the sawhorses and swept up the sawdust so the congregation could hold their worship services sitting in lawn chairs and singing hymns to the accompaniment of an accordion. Sunday School classes met under the trees. That old building now forms the kitchen area of Deicke Auditorium. In February, 1950, the congregation drew up a creed and a constitution and by-laws. 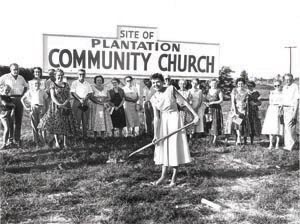 Articles of incorporation were approved and on March 10, 1950, the State of Florida granted a corporate charter to the Community Church in Plantation. Frederick Peters offered the church a choice location – four-and-a-half acres of land on Broward Blvd. - if the members would raise the money for a building. On July 14, 1957, a dedication service was held in the beautiful A-frame sanctuary designed by Russell Pancoast, Plantation’s city planner. In the 1960’s the members added a building with Sunday School classrooms, which is now the home of Plantation Christian Pre-School. In 1980, they celebrated the completion of the fellowship building with classrooms, offices for the staff, and a large meeting hall and kitchen. In March 2008 they marched proudly into their beautiful new sanctuary. A rich heritage and bright future...come see for yourself!